United Launch Alliance today announced the successful first hot-firing of the new Pratt & Whitney Rocketdyne RS-68A engine that will be used to power a future upgraded version of the Delta IV Heavy Lift launch vehicle. 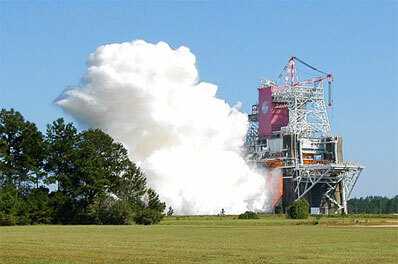 The hot-fire test was conducted 3:16 p.m. CDT, at NASA's John C. Stennis Space Center, Miss., today. Stennis is the home of America's largest rocket engine test facility. The RS-68A engine, an upgraded version of the current RS-68 liquid hydrogen-liquid oxygen engine used on Delta IV, will allow the Delta IV Heavy vehicle to boost heavier payloads into orbit. Currently, the RS-68 engine can deliver more than 660,000 pounds of sea level thrust and the upgraded RS-68A will increase this to more than 700,000 pounds. The RS-68A also improves on the specific impulse, or fuel efficiency, of the RS-68. The Delta IV Heavy is comprised of three Delta IV core boosters. With the new RS-68A engines, the Delta IV Heavy's thrust will increase by more than 100,000 pounds. The hot-fire test lasted the full planned duration of approximately 40 seconds and the test team will spend the next several days evaluating data to characterize engine performance and to clear the engine for future tests. This initial test was on the first of three engines that will be used during an extensive engine test program. The test program will continue during the next twelve months, leading to certification of the new engine in mid-2010 and initial launch capability of the upgraded Delta IV Heavy in early 2011. "We congratulate Pratt & Whitney Rocketdyne and the entire RS-68A engine team for this successful first step in making the most powerful liquid hydrogen-liquid oxygen engine in the world even more capable," said Jim Sponnick, ULA Vice President, Delta Product Line. "The RS-68A upgrade is a critical element in upgrading the Delta IV Heavy allowing ULA to meet evolving needs of our government customers with even greater reliability and performance than achieved in the past, while keeping mission success our top priority." ULA program management, engineering, test and mission support functions are headquartered in Denver, Colo. Manufacturing, assembly and integration operations are located in Decatur, Ala., Harlingen, Tex., San Diego, Calif., and Denver, Colo. Launch operations are located at Cape Canaveral Air Force Station, Fla., and Vandenberg Air Force Base, Calif.